In a far-reaching order to deal with the �massive� problem of �astronomical levels� of black money stashed in secret overseas bank accounts, the Supreme Court today directed the government to set up a Special Investigation Team (SIT) headed by former apex court judges BP Jeevan Reddy and MB Shah and disclose the names of such bank account holders against whom show-cause notices have been issued. Andhra Pradesh today plunged into a political crisis over Telangana issue with an overwhelming majority of MPs, MLAs and MLCs from the region, belonging to both the ruling Congress and the main opposition Telugu Desam Party, submitting their resignations in support of the statehood cause. Buying performance-enhancing drugs in this town isn�t even close tobeing difficult. On the contrary, Patiala has the dubious distinction of being the place where getting these drugs is as easy as shelling peas. The Supreme Court today dismissed the petitions filed by Chautala brothers Ajay and Abhay challenging corruption charges against them. The apex court has thus cleared the way for the criminal prosecution of the Indian National Lok Dal leaders in disproportionate assets cases filed against them by the CBI. With a majority of political parties giving a short shrift to Anna Hazare�s Jan Lokpal Bill draft, senior BJP leader Arun Jaitley too followed the same course and spelt out his party line demanding PM be brought under the purview of Lokpal at the all-party meeting yesterday. In a development that will embarrass the BJP further, Karnataka Chief Minister B S Yeddyurappa today admitted that he had allotted residential sites in Mysore to his relatives. The Chief Minister, however, tried to justify the allotment, saying the sites (numbering four) were given to his relatives on compassionate grounds. 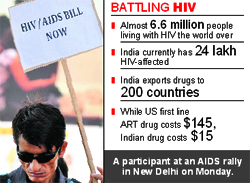 India�s fundamental role in the global response to the HIV/AIDS epidemic came to the fore today with the UNAIDS chief giving the country�s robust pharmaceutical sector credit for improved global survival rates and treatment possibilities by meeting bulk of the global drug demand at phenomenally low costs. India exports drugs to 200 countries.